I am sitting at the dealership having keyless entry put on my new truck. Weird that it didn't come with that. There are a lot of "options" I can do without in a truck. I don't need a DVD player or heated seats, but I do need that little clicker on my key chain to make my life easier. The other night I hit lock on the door before John got his coat out of the backseat and we exchanged words. Simple gadgets for keeping the peace. The dealership does have a business center. I started out by using their computer but found they firewalled all my favorite sites and they were not x rated! Facebook? Blogspot? Please! So I had my laptop (or loaner laptop - long story) with me, so I pulled it out and viola`, I am back in business. Today is an optional holiday at work. I was feeling pretty beat up last night so decided to take the option. I can't say I feel worse today than yesterday, but I do have some new aches and pains. And a bruise has finally appeared and its not on the side I fell on. 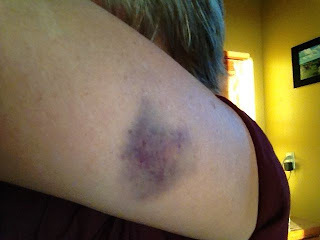 Perhaps from the saddle horn as this arm would have been coming across the saddle when I went down? Who knows. Call me crazy but I do find bruising fascinating. 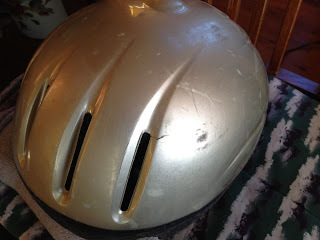 My helmet ended up with some smudges and 2 small cracks. You can see one of the cracks by the vent. The other can't be seen as well; it is over by the ear. This helmet has seen its day. I have other helmets I can wear - I have seemed to collect them lately. Thanks for all the notes about wearing a helmet. I know those of you who do know the importance, and perhaps someone who doesn't, will think about it now. Its possible I have a mild concussion - undiagnosed by anyone but me (but I bet Mindee would agree.) Having two boys in football, I recognize the symptoms and know there is nothing you can do about it except try not to get hit in the head again for awhile. My internet doctor says, "For mild concussions, you should get plenty of rest during the day and sleep at night. Gradually return to your normal activities, without over doing it. Ibuprofen can be taken under a doctors advice, but avoid alcohol and other drugs." I've reluctantly laid off the pinot noir and only rode 5 miles yesterday. At a walk. Nice bruise. I love it when they turn pretty colors, except the yellow always freaks me out a little. Glad you're replacing your helmet. I replaced mine but not before I tore the black velvet off and searched for cracks. A mild concussion is probably likely but I'm sure you'll feel better soon. Hope your keyless entry goes well. Tammy,so many thoughts come to mind when I see the photo of your helmet. I am just so glad you were wearing yours! The area that looks like it took the hit was in the exact same area that my sister suffered her head trauma, which resulted in a blood clot/surgery & a few weeks in a coma. She recovered & still continues to ride. We both now ALWAYS wear a helmet. All that keeps repeating in my head is that I'm so glad you were wearing your helmet! No excuses! Each & every single time!! The official party line is that if you take a hit to the helmet, even if it doesn't LOOK messed up, you should replace it - the foam internal structures have been compromised. Last time I fell and hit my head I went ahead and replaced the helmet. It'd get financially painful pretty quickly though! Wow, that bruise is shaping up nicely. I'm kind of obsessed with them too, Tammy - It's so crazy to watch the colors come in and change. I saw your wreck story this weekend but I was trying very hard to NOT get sucked into blogging. Ouch, and a very gentle hug to you! I find bruises extremely interesting, too. It's nice when you look as bad as you feel. Last summer I stood up under a bare saddlerack & gave myself a pretty good bump on the temple but thought no more about it. A couple weeks later I happened to notice a shadow in my eye socket. "Honey am I getting a black eye?" (and if so, why?). "Sweetie, you've HAD a black eye for a while, I thought you knew it!". Sigh. Guess I don't look in the mirror too often! I find bruises fascinating too, but that probably doesn't surprise you. Wow. You did fall. Glad about the helmet. I started wearing one a few years ago and I would never step on a horse again without it. Our new truck came with that starter thing so you can start it from the house. THAT is gold. Everything else I can do without. Oh wait. Except the Sirius radio. I'm hooked on that too.